We are excited to start working on our first section of trail in Bradford. 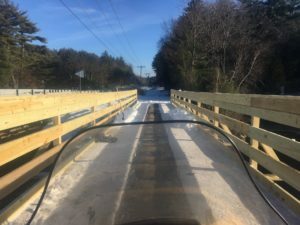 Friends of the Concord Lake Sunapee Rail Trail partnered with the Lake Sunapee Snowmobile Club and the Rural Heritage Connection of Bradford to create this extension of the Tilley Wheeler Trail including a new bridge parallel to the Route 103 crossing over Lake Todd. (Early December 2018 status) The bridge is now complete. 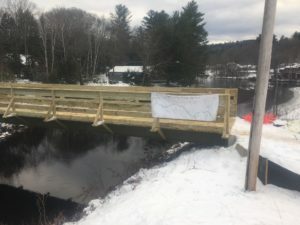 Winter came a bit earlier than desired this year and the final grade approaching the bridge on both sides and the stone dust surface will be put down in the spring of 2019. 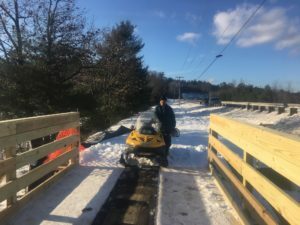 The bridge and trail will be open year round. When snow covered its open for snowmobiles, cross country skiing, snowshoeing walking and biking. During the warmer months the trail is open for walking, running, bicycling, walking the dog, and equestrians. Because the trail is stone dust it is not open to motorized wheeled vehicles. 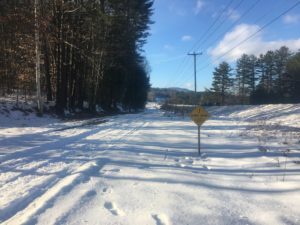 The Lake Sunapee Snowmobile Club was the official applicant on the Recreational Trails Program grant from the NH Bureau of Trails that provided funding for this trail. All three groups shared the financial responsibility for raising the matching funds. 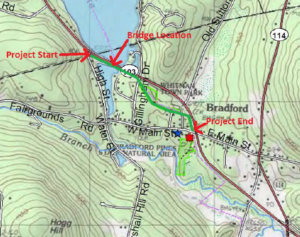 In October of 2018 friends of Robert Saturley drove by and saw the bridge under construction. Robert was killed riding his bicycle on Route 103 in Newbury in 2011. Many years earlier he worked on the Route 103 road bridge in Bradford while a student at UNH. His friends were motivated to help us create this safe path for cyclists, pedestrians and snowmobiling. They started a GoFundMe campaign to raise money for the project. We can not thank them enough for taking the initiative. 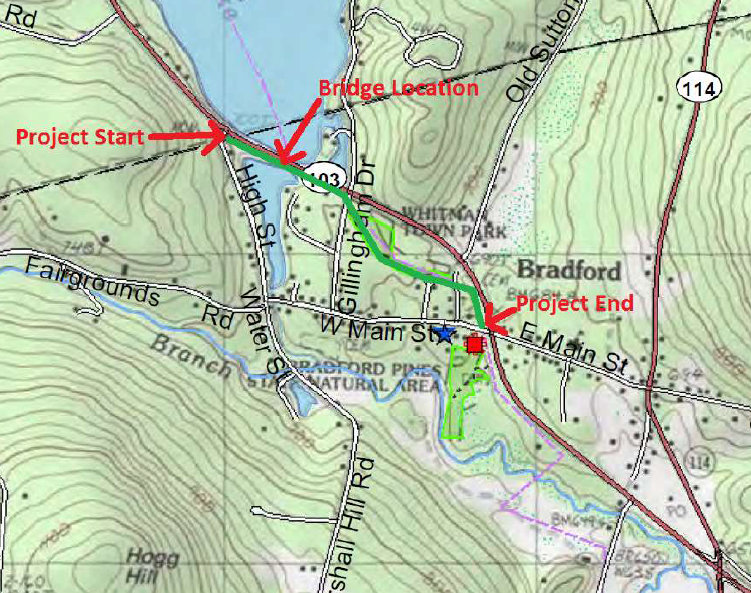 Thanks to their help we will apply for a subsequent RTP grant to extend this trail. Lake Sunapee Snowmobile Club Trail Master Mike Couitt. Mike was at the bridge every day of construction. He was a huge help getting it done and done right. View of the Quiet Please Sign put up by the snowmobile club at the request of nearby residents. The request was made during a public planning meeting ahead of construction.